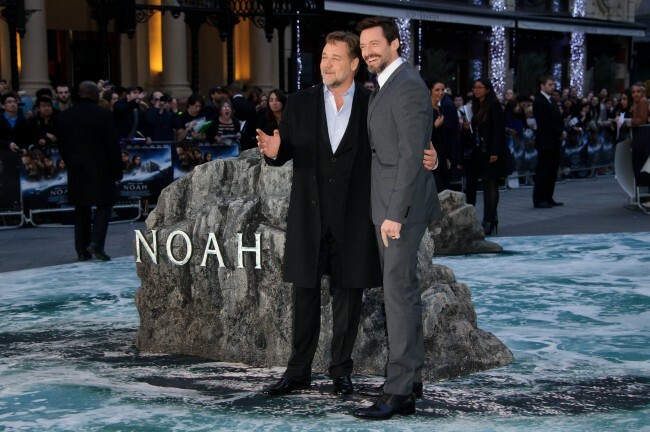 From left, New Zealand actor Russell Crowe and Australian actor Hugh Jackman arrive for the UK Premiere of Noah at a central London cinema, London, Monday, March 31, 2014. PEOPLE have long chuckled about America’s insistence that people from the Middle East are white. Apart from present day Middle Eastern people of course. They HATE those guys. We’re talking about the meme that got out of hand. European artists painted Jesus as a white guy and everyone cleverly ignored the fact that he would have at least been olive-skinned, or even darker. He definitely wasn’t some white guy with fair hair and a neat beard who looked like he might be the road manager for Creedence Clearwater Revival. So too, the rest of The Bible’s important figures found themselves being whitened, in modern American depictions especially. And so, to Noah, who just happens to be the subject of a new film and, unsurprisingly, he’s played by a white guy; Russell Crowe. That aside, some viewers of the film noticed something unusual – not only was Noah white, but absolutely everyone in the film was. Not a Person Of Colour to be seen on screen. What with the race of the cast, and a lot of water knocking about thanks to a flood, there’s probably a ‘whitewash’ joke you could do at this juncture, but that seems a bit lazy. In an interview on the website The High Calling (HERE) the co-screenwriter of the film Ari Handel, who wrote Noah, was asked about the lack of diversity. What he said might sound like clutching at straws. In addition to that, it almost sounds like they actively decided against it. Which is weird because, surely, if you’re going to make a religious film – and as we know, religion hopes to represent the whole of mankind – it’d be really weird to not literally try and represent the whole of mankind. Back in the real world, where real world problems are, it is infuriating to see film being made where they seemingly decided that acting jobs should only go to white faces. And they didn’t make it a factor because they were “dealing with the everyman”? Get that non-white people? You’ve been relegated to something beneath the ‘everyman’.